We had sailed with HAL on 3 previous cruises. We chose this cruise for the itinerary and had just been on Celebrity Solstice six weeks prior to this one and so comparisons between them were fresh in our minds. Where Solstice is clean crisp lines with what we thought were much higher ceilings, Noordam is lower ceiling, less open spaces, fine arts but darkened lounge areas. Noordam did not come close to Solstice from the quality of their food, attention to detail and service of the crew. Embarkation for Noordam was slow. Our cabin was spotless our only complaint were the lumpy pillows. Our attendants always had a smile and were happy to assist to meet our needs. Dining - this is one of the features of cruising that we enjoy and were let down terribly. The menu selection and quality of food was poor, even in the Pinnacle Grill. We thought the standard in the Main Dining Room had dropped from our previous cruise with HAL but had improved measurably in the Buffet Dining (Lido). At all three dining venues we found the selection of deserts (and slices) disappointing. The attention to hygiene on board the ship was lacking. Rarely did we see a crew member ensuring that passengers used the sanitizers before entering the dining areas. The Air conditioning was poorly balanced and some areas of the ship were warm and others were very cold. Hence there were a lot of sick people on board. In the theatre during lecture and showtime there was constant coughing by passengers. Activities - not a great deal of variety or imagination used in planning the activity programme. The Test Kitchen was American food which was not to the Australian culinary style. exc Talks - Two great speakers were the Barrier Reef Pilot and Brian Stoddart who did a series on the Pacific the influences through history, art, internationalisation etc. The other speaker did a series on World War II in the Pacific is content was very disappointing. Entertainment - The highlight was the Planet Earth documentary accompanied by the String Quartet and Band. Fantastic! Mix of entertainers and three dance/shows. The BB King had us all tapping along with the music - they were great. Our first port of call was Gladstone....A wasted day. Not much to do or see the city tour included pointing out Bunnings and the local Library as sites of the town! Alotaou was not so much scenic as historically interesting port. If you are interested in the Second World War and the fighting in Milne Bay you will find doing a tour/excursion worthwhile. You will find locals portside who will take you on a tour of Alotaou. The next 2 ports were Kiriwina and Kitava Islands. Both beautiful islands where you can meet friendly tribal people These islands surpass the South Pacific Islands for swimming and snorkling in their lovely clear coral waters. You could buy wooden bowls carved by the village men or woven bags from the ladies. They do appreciate KENNA currency. Buy your currency before you leave home. Dont buy it off HAL they would not take back any unused currency (and they could sell you notes in poor condition that a bank will not accept - this happened to one passenger on our cruise). Next stop was Conflict Islands - this is a group of Islands owned by an Australian. It is very picturesque but very commercialized. (Buy any carvings or bags on this Island and expect to pay at least four times the price as on the other two islands... and you are not buying from the tribes person direct.) Our other ports were Cairns (Yorkies Knob) and Airlie Beach and then Brisbane. This cruise is not a cruise for those with disability issues. Only 3 ports were to a dock, five ports were by tender. The tenders were efficiently run and we did have to wait more than a couple of minutes at each port. It was extremely hot and it was lovely to have ice water and iced handtowels to greet us on and off the islands. One thing we did appreciate was the limited "on-sell" of spa, dining & drinks packages. It only occurred the first day or two. There are two issues that really were unsatisfactory.... 1. US$25 per person to get a shuttle bus from the wharf to Brisbane CBD. At Airlie Beach we paid A$5 in Australian dollars. Didn&apos;t add up paying Australian dollars on one occasion and USA dollars (at an exorbitant price) on the other. 2. No Christmas Carols on board the ships PA system. The ship was decorated with Christmas Decorations but no music. At requesting at the Guest Relations for some Carols to be played on the PA we were advised that the company had made a directive that no HOLIDAY MUSIC be played until the 22nd December. Yet they were quite happy for us to pay the ship&apos;s photographer to take "our CHRISTMAS PHOTO taken by the CHRISTMAS TREE". This is not the cruise line for children.. and especially around Christmas time. We were so disappointed at not being put into the Christmas spirit, that I doubt we will ever go on a cruise at Christmastime again with HAL. We had sailed with HAL on 3 previous cruises. We chose this cruise for the itinerary and had just been on Celebrity Solstice six weeks prior to this one and so comparisons between them were fresh in our minds. Where Solstice is clean crisp lines with what we thought were much higher ceilings, Noordam is lower ceiling, less open spaces, fine arts but darkened lounge areas. Noordam did not come close to Solstice from the quality of their food, attention to detail and service of the crew. Embarkation for Noordam was slow. Our cabin was spotless our only complaint were the lumpy pillows. Our attendants always had a smile and were happy to assist to meet our needs. Dining - this is one of the features of cruising that we enjoy and were let down terribly. The menu selection and quality of food was poor, even in the Pinnacle Grill. We thought the standard in the Main Dining Room had dropped from our previous cruise with HAL but had improved measurably in the Buffet Dining (Lido). At all three dining venues we found the selection of deserts (and slices) disappointing. The attention to hygiene on board the ship was lacking. Rarely did we see a crew member ensuring that passengers used the sanitizers before entering the dining areas. The Air conditioning was poorly balanced and some areas of the ship were warm and others were very cold. Hence there were a lot of sick people on board. In the theatre during lecture and showtime there was constant coughing by passengers. Activities - not a great deal of variety or imagination used in planning the activity programme. The Test Kitchen was American food which was not to the Australian culinary style. exc Talks - Two great speakers were the Barrier Reef Pilot and Brian Stoddart who did a series on the Pacific the influences through history, art, internationalisation etc. The other speaker did a series on World War II in the Pacific is content was very disappointing. Entertainment - The highlight was the Planet Earth documentary accompanied by the String Quartet and Band. Fantastic! Mix of entertainers and three dance/shows. The BB King had us all tapping along with the music - they were great. Our first port of call was Gladstone....A wasted day. Not much to do or see the city tour included pointing out Bunnings and the local Library as sites of the town! Alotaou was not so much scenic as historically interesting port. If you are interested in the Second World War and the fighting in Milne Bay you will find doing a tour/excursion worthwhile. You will find locals portside who will take you on a tour of Alotaou. The next 2 ports were Kiriwina and Kitava Islands. Both beautiful islands where you can meet friendly tribal people These islands surpass the South Pacific Islands for swimming and snorkling in their lovely clear coral waters. You could buy wooden bowls carved by the village men or woven bags from the ladies. They do appreciate KENNA currency. Buy your currency before you leave home. Dont buy it off HAL they would not take back any unused currency (and they could sell you notes in poor condition that a bank will not accept - this happened to one passenger on our cruise). Our other ports were Cairns (Yorkies Knob) and Airlie Beach and then Brisbane. This cruise is not a cruise for those with disability issues. Only 3 ports were to a dock, five ports were by tender. The tenders were efficiently run and we did have to wait more than a couple of minutes at each port. It was extremely hot and it was lovely to have ice water and iced handtowels to greet us on and off the islands. One thing we did appreciate was the limited "on-sell" of spa, dining & drinks packages. It only occurred the first day or two. 1. US$25 per person to get a shuttle bus from the wharf to Brisbane CBD. At Airlie Beach we paid A$5 in Australian dollars. Didn&apos;t add up paying Australian dollars on one occasion and USA dollars (at an exorbitant price) on the other. 2. No Christmas Carols on board the ships PA system. 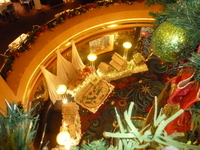 The ship was decorated with Christmas Decorations but no music. At requesting at the Guest Relations for some Carols to be played on the PA we were advised that the company had made a directive that no HOLIDAY MUSIC be played until the 22nd December. Yet they were quite happy for us to pay the ship&apos;s photographer to take "our CHRISTMAS PHOTO taken by the CHRISTMAS TREE". This is not the cruise line for children.. and especially around Christmas time. We were so disappointed at not being put into the Christmas spirit, that I doubt we will ever go on a cruise at Christmastime again with HAL. Most informative. It was very hot. Tour operator provided everyone with a bottle of water. Visited the 3 airdromes and site of Japanese landing and bombed Japanese boat. Also visited lookout and memorials.